I realized recently that I was not inspired to share my weekly menu plans – sporadic as they have been – because they were simply not inspiring. Not for you and not for me. That was just the phase we found ourselves in. The holidays took over and then the new year felt daunting and exhausting and preparing not only a list of meals for the week ahead – but one that would get me excited in the kitchen – felt like a challenge. But this week, I remembered that I don’t shy away from challenge, I embrace it. So I decided to make this week’s plan almost entirely new recipes – for me and for you – in the hopes of getting us both back in the kitchen in an inspired way. Sunday – made this five ingredient pasta from Gimme Some Oven. It was a great combination of flavors and it got my kids to happily eat kale, which is always nice. But I erred on the side of conservative with the amount of cheese I used and the result left the pasta a little dry. Next time, I will follow her measurements. Overall, easy to make even on a weeknight and the whole family enjoyed it. Monday – tonight we are going for our favorite – and easy – fish tacos. Simply salt and pepper tilapia (we use one piece per person) and sauté it with your favorite green salsa. Serve with warm tortillas, Trader Joe’s corn salsa, avocado slices and lots of lime. If you need more filler, cilantro lime rice is a great addition, but we typically fill up just fine on the tacos alone. Don’t skip the corn salsa, it is a game-changer. Mango salsa also a favorite. Tuesday – Thai meatballs with rice. Ground turkey and zucchini meatballs topped with a homemade red curry sauce. We love Thai flavors around here and I am excited to try my hand at making this one at home. Will report back. Wednesday – Mediterranean chicken with a dill yogurt sauce. I easily serve chicken at least three times per week, if not more. I am always looking for new ways to serve it up and these fresh, vibrant Mediterranean flavors look amazing. Thursday – it’s Valentine’s Day! Our plans are up in the air and may include a few hours of night skiing and will definitely include our kids so I am not planning to cook or be near my kitchen. In the name of love, of course. 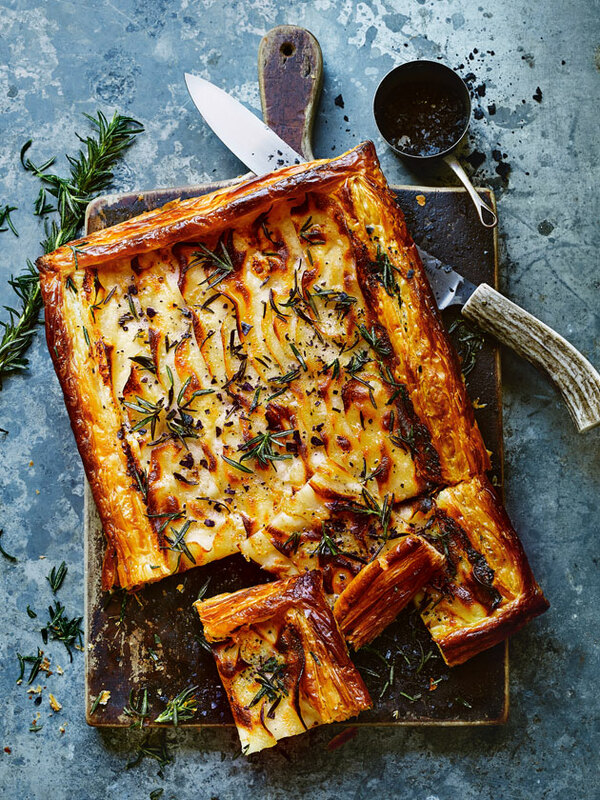 Friday – I may or may not get to this one on a Friday night (if I don’t, I think I will save it for Sunday) but I bought all the ingredients to make this rosemary mascarpone and potato tart from Donna Hay (photo above – isn’t it gorgeous??). I will serve it with an arugula salad and a great glass of red. And if it turns out even half as pretty as hers, I will consider it a win. Yum! Everything sounds delicious. I have been cooking the same dishes; should at least try 1 new recipe a week. That is a gorgeous tart! I have old copies of Donna Hay magazine that I flip through from time-to-time, even for just the beautiful, mouth-watering photos… Hope you’re enjoying some snow!